Thanks to, nay, many thanks to, an offer of LOTS of extra hours this week and next, don’t expect a lot of ADDled thoughts for the next ten days or so. Here are some to be getting on with. 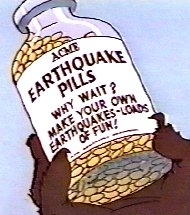 A complete Catalogue of ACME products is available online. There was an earthquake, magnitude 6.0, this morning off the coast of West Sumatra. It didn’t cause any damage. Still in Sumatra, there are reports of further killings of Acehnese by the Indonesian military this month and it is thought that the decision of the government to re-settle the people in semi-permanent barracks-style camps could be misused by the military to control the population. For this and other reasons, last week two human rights groups called the U.S. Department of State’s plan to allow Indonesia to again participate in the full International Military Education and Training (IMET) program short-sighted, a betrayal of the numerous victims of human rights violations by the Indonesian military (TNI), and a serious setback for justice. Corruption Watch ~ good news? The Supreme Audit Agency (BPK) will collaborate with state comptrollers from foreign donor countries to audit all financial aid channeled to tsunami-stricken Nanggroe Aceh Darussalam. “It has been nearly two months since the deadly disaster. Yet, not a single auditor has been deployed at the devastated areas to make an account of the channeled funds,” BPK chairman Anwar Nasution said yesterday. “Places of worship are abundant and filled to capacity, some 200,000 people also perform the haj pilgrimage every year. But corruption is still rampant,” said Muslim cleric Solahuddin, also deputy chairman of the National Commission on Human Rights (Komnas HAM). Some prominent corruption cases have even occurred within the Ministry of Religious Affairs. Ukman Sutaryan, 68, the former West Java Deputy Governor, from 1994-1998, has been sent to Kebonwaru prison in Bandung after receiving medical treatment at Hasan Sadikin Hospital in the city. Ukman, who was convicted for the embezzlement of over Rp 5 billion (approximately US$546,000 at current exchange rates) from the West Java budget, managed to delay his detention for several years as the case dragged on. Now, I’m off to bed. But which one?